Gunung Rinjani (3,726 m), on Lombok, Nusa Tenggara Barat, is the second highest volcano in Indonesia after Gunung Kerinci (3,805 m) in Sumatera and just higher than Gunung Semeru (3,676 m) in East Java. It is one of the most spectacular and popular climbs in South-East Asia attracting thousands of climbers, both local and foreign, each year. Rinjani is the toughest of the ‘toughies’ that Java Lava climbs regularly. 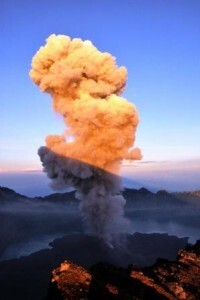 Rinjani is thought to be the location of a ‘Mega-Colossal’ eruption in 1257, with Volcanic Explosive Index = 7 (out of 10). The eruption of Tambora in Sumbawa in 1815 was of a similar magnitude. This 1257 eruption is postulated from volcanic ash records in ice sheets in the absence of any written records, and is thought to have changed the climate around the world causing the ‘little ice age’. The huge caldera, that we see today, is certainly the result of an enormous eruption. 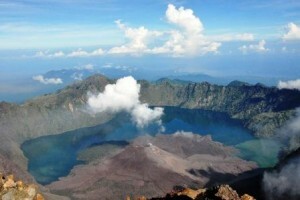 The Rinjani complex is spectacular in itself as well as the fantastic views from its summit and other vantage points. 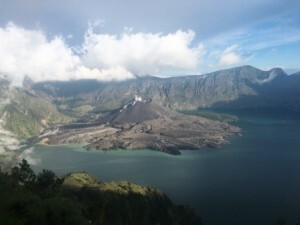 A large, picturesque lake, Danau Segara Anak, at about 2,000 m, lies within the caldera that is about six km in diameter. Gunung Barujari is a vent within the caldera that erupts occasionally growing into a small volcanic cone in its own right. Barujari (2,363 m) can be climbed if not active but this requires an additional day camping by the lake. Hot springs near the lake are great to mandi and relax. The peak towers over the lake to the east with an almost vertical drop of 1,730 m.
The ultimate achievement is to see the sunrise from the summit of Rinjani. Temperature at the summit may be around zero before sunrise so be properly prepared. Besides the very strenuous climb, strong winds may add to the challenge. Deaths from hypothermia are not uncommon. If the weather is bad, the summit climb may not be possible. Several vantage points offer spectacular views: Sembalun Rim – into Danau Segara Anak; Rinjani summit – Gunung Tambora in Sumbawa to the east and Gunung Agung in Bali to the west and everything between; and, Senaru Rim – some of the finest views to be experienced anywhere including of Danau Segara Anak and the mountain peak. 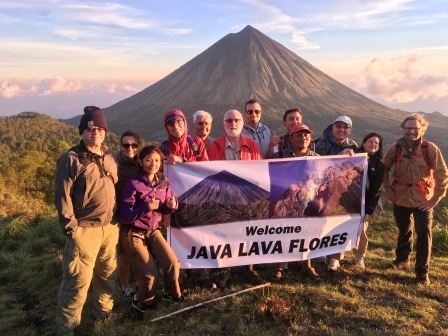 Java Lava hires a local trekking group for the climb. Guides, porters and main meals/water are provided. Water is available at several points along the trail. There are three main campsites, two on the caldera rim (Sembalun Rim and Senaru Rim) and another within the caldera by the lake. Temperatures can drop to five degrees on the rim. Be alert for scavenging monkeys! 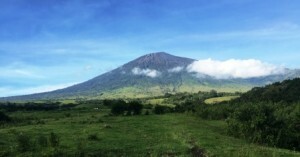 Profile of the Trek: Java Lava climbs from the visitors centre at Desa Sembalun and descends to Desa Senaru. This is a three-day trek with two camps on the mountain: first at Sembalun Rim and the second at either beside the lake or on Senaru Rim. First day: Vertical ascent about 1,520 m (10 km). The trail head at Sembalun is at about 1,130 m; pleasant walk through farmland, some forest and grassland; increasingly steep from Pos III (Pada Balong) at about 1,770 m to the campsite at Sembalun Rim (aka Plawangan Dua) at 2,650 m.
Second day: Summit ascent (1,080 m, 7.5 km return); very early start (like, 2 or 3 am) with the aim of being on the summit for sunrise; 3-4 hrs; extreme care required. Three stages, roughly: (1) 350 m – steep through high-altitude vegetation until reaching a high ridge on the crater rim (great views in moonlight). (2) 400 m – increasingly steep but with compact surface making for relatively easy climbing. 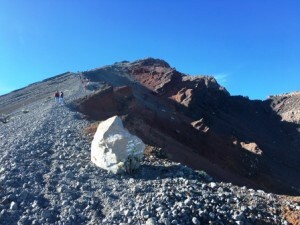 (3) 330 m – extremely challenging and exhausting; loose scoria, deep, soft volcanic sand on a 30-degree slope; “one-step-up, half-step down”; oxygen becoming thinner. Descend to camp; breakfast; break camp. Descend about 650 m into the caldera to Danau Segara Anak; initially very steep, rocky and slippery; extreme care required; flattens out closer to the lake. Relax in the hot springs; lunch by the lake. Java Lava may decide to push on around the lake and ascend 620 m to Senaru Rim (aka Plawangan Satu) at 2,620 m and camp on the rim. This trek, including summit, involves a total vertical ascent of 1,700 m and vertical descent of 1,730 m over a total distance of 14.5 km. This makes for an extremely tough trek in one day. Java Lava may decide to camp the second night by the lake instead. 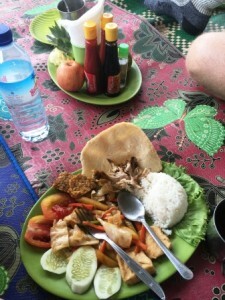 Third day: assuming camp at Senaru Rim, the vertical descent is 2,040 m over 11 km. The trek to Desa Senaru, at about 580 m, is initially very steep through high altitude grasslands, transforming into higher forest at lower altitudes and eventually farmland. Fit trekkers might descend in three hours; others may experience a painful descent of 4-6 hours with legs ‘turning to jelly’. Total metres climbed over three days: Including summit: ascent – 3,220 m, descent – 3,770 m, and 35.5 km. Excluding summit: ascent – 2,140 m, descent – 2,690 m, and 28 km. 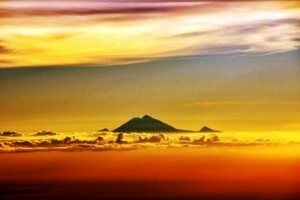 Suitability: Rinjani must be taken seriously. You will be trekking for many hours each day over three days. As with all Java Lava trips, you join at your own risk (see Indemnity Statement). This trip is for fit, experienced and properly equipped climbers. Read the section, Safety on Mountains, carefully. The fitter you are the more you will enjoy the trek. You must assess your own ability based on the Profile of the Trek in deciding whether to join. The summit climb is tough. There is no shame if you omit this section; rather, this is a wise decision if you are not confident that you can make it to the summit. Program: Java Lava will send a Circular, providing details of logistics, etc., to those who express interest in joining this trip when announced.